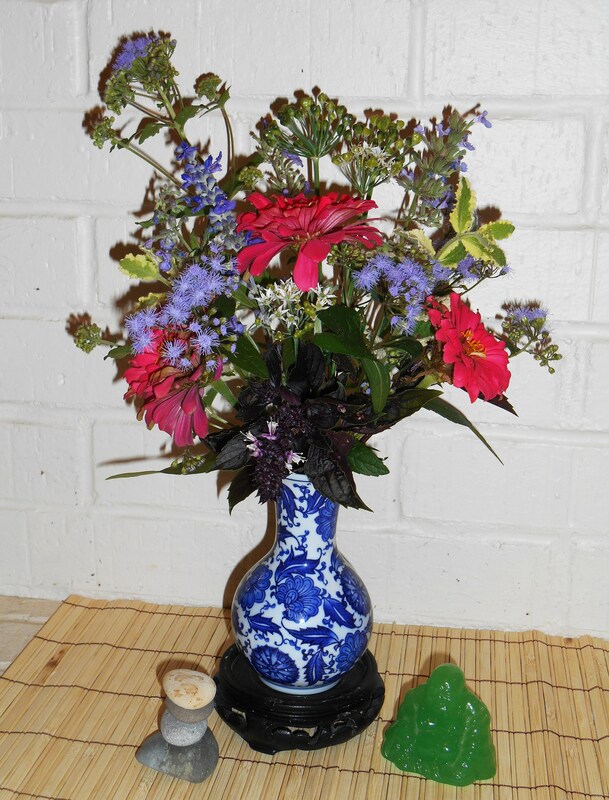 We are past Labor Day, that great holiday marking the end of summer in the United States; and finally I’ve cut some Zinnias for our vase. These are lovely Zinnias. I love their soft but vibrant pink petals. I’ve admired them every day for weeks now, but have refrained from cutting any to bring indoors. I’ve only cut off spent blossoms in order to inspire the plants to push out more. These Zinnias are a tender spot for me. No, not a warm and fuzzy tender spot. They are a guilty tender spot. You see, I bought them. When the several dozen Zinnia seeds I had carefully ordered and later sowed out in the beds failed to produce; I bought a few potted Zinnia plants from our friends at the local farm stand. 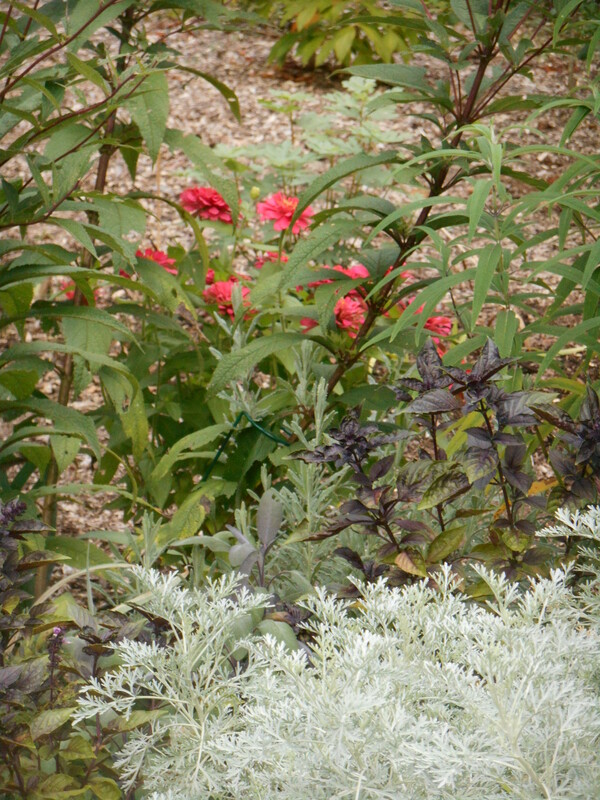 They were so far along that I planted them, pots and all, in a few prominent spots mid-summer. 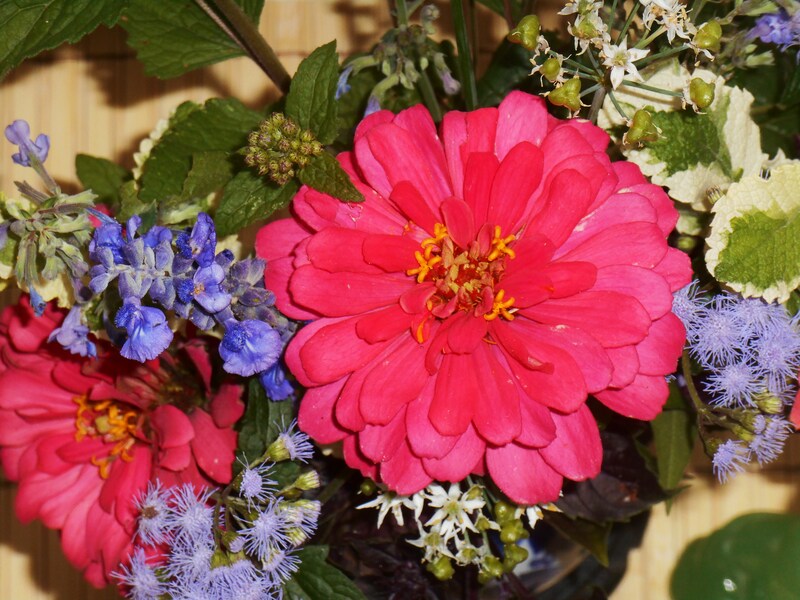 Now how much gardening skill does it take to grow Zinnias from seeds??? I’ve done it often in the past. And, in retrospect there are now a few of my home sown Zinnias blooming in the butterfly garden. But my grand winter plans for rows of Zinnias, ripe for cutting, failed to materialize in the vagueries of spring. I first sowed the little seeds in wet paper toweling, as I often do with bean seeds, and then planted each little packet into the beds. Needless to say, it didn’t work well this time…. Next year, back to the trays or little pots for sowing those precious seeds. But enough of gardening angst. 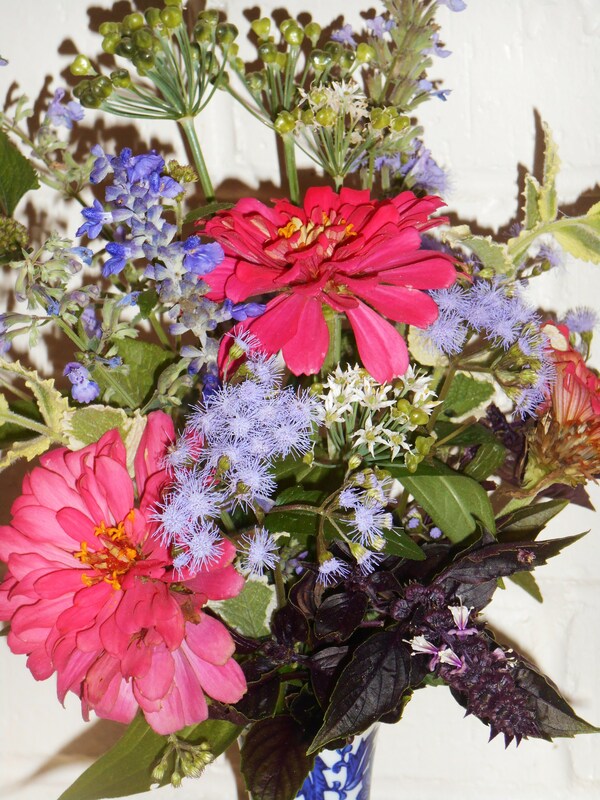 We’ll celebrate these lovely Zinnias blooming so vibrantly with the Blue Mist Flowers, Salvia, purple Basil, Pineapple Mint, Catmint and Garlic Chives. One thing I enjoy about these vases is how I can capture the essence of things blooming all over the garden into one tiny vase. 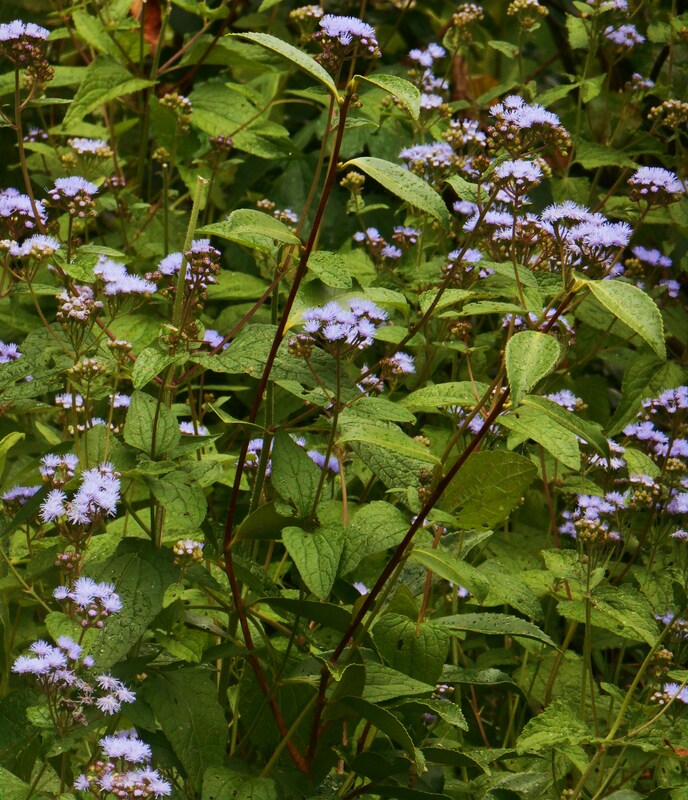 The Blue Mist flower self seeds, and is also a spreading perennial. 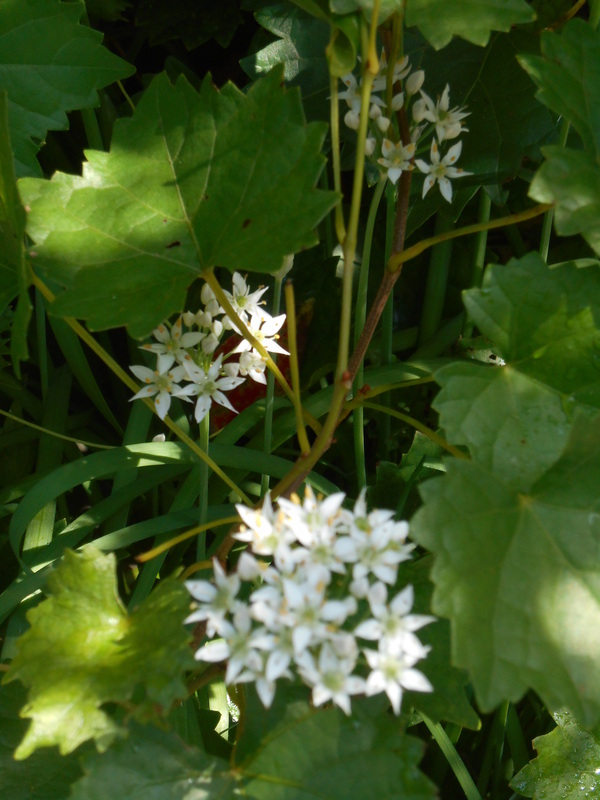 It is popping up in nearly every part of the garden this summer. I’ve been spreading the Garlic chives around for several years now. Another self-seeding perennial, they are also blooming in surprisingly random places in the garden at present. 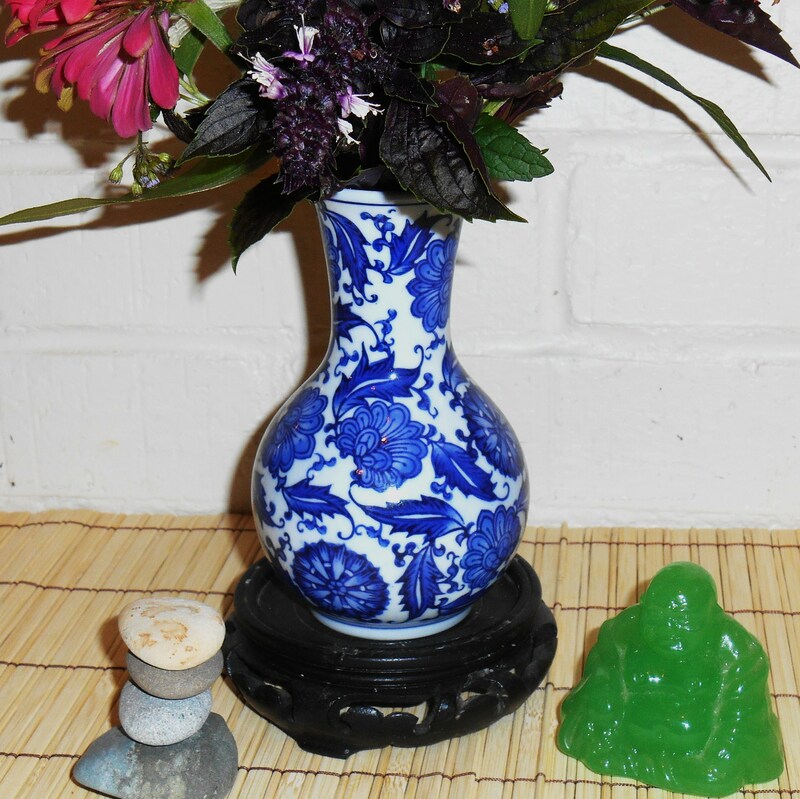 The “Jade” Buddha was given to us by a friend at Chinese New Year. I included it today after learning, just this week, the story of the “Emerald” Buddha of Thailand. This “Emerald” Buddha statue has a long and mysterious history which likely began in southern India in the years before the Common Era, and continues today in modern Bangkok. The stones were picked up while walking along an Oregon beach. The season is turning yet again, and it feels like as good a time as any to ponder our successes and shortcomings of the last few months. It is a good time to process gardening, and life lessons, learned; while at the same time entertaining plans for the seasons coming. 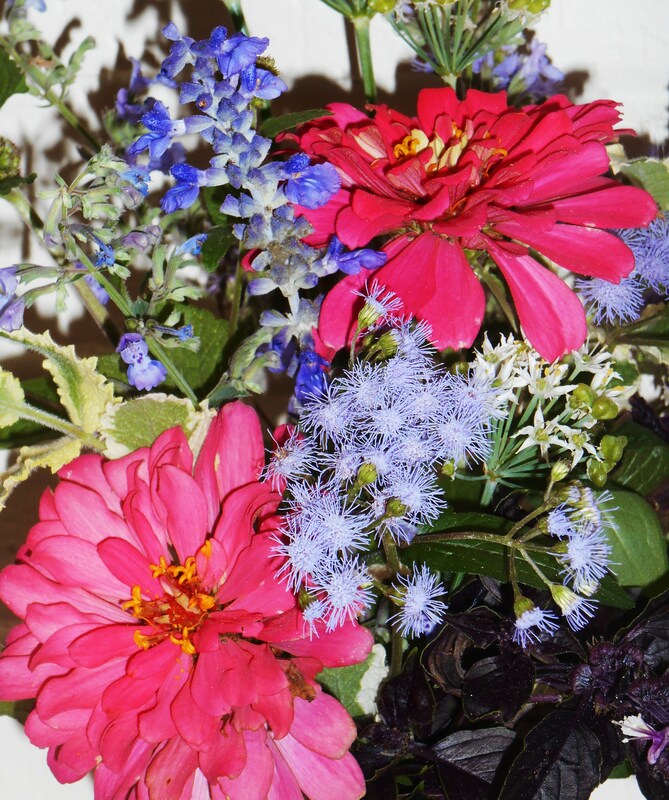 Another gardening blogger wrote of sketching her cuttings beds for next season, now. Plans made now will likely be more realistic than those we plot over the winter catalogs in February, don’t you think? I’m building some new beds in the sunny front garden. I’ve already planted some new Iris roots, and am ready to plant bulbs as soon as some rain comes to soften the soil a bit. Once the weather turns more towards autumn in a few weeks, I’ll also move some shrubs from their pots to the Earth. The trick at the moment is to spend enough time watering and weeding to keep things alive until it rains again. Though brutal at times, nature also offers us the opportunity to try, try, again each season; in the continual pursuit of our green and growing dreams. 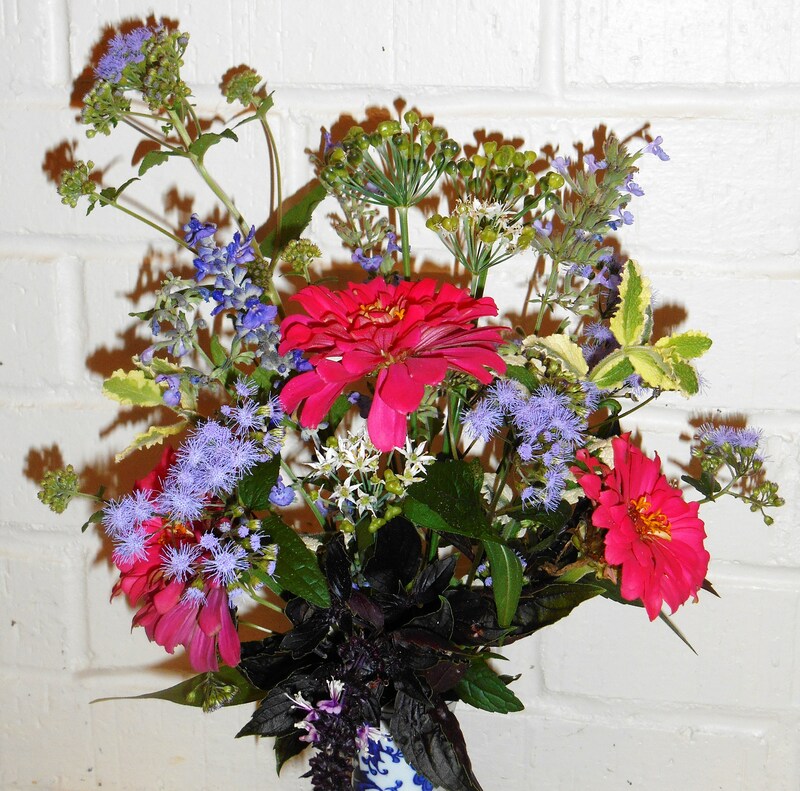 Please take a moment to visit Cathy at Rambling In The Garden to enjoy more beautiful gardening successes, captured for a moment in time In A Vase this week.